I was allowed one last walk outdoors before transplant day. It may be weeks post-BMT before I’m released from hospital, so one of my loving nurses offered the chance to disconnect from my conditioning plan for a short visit with the pups. It took careful planning, timing and patience, but Gabriel brought them down to Emory and Ramon took them home. Chris and Katrina made it safely to Atlanta this morning, and Alexis will close the circle as she returns from SCV for transplant day. Together, we are ready to face the next and most significant part of this journey. 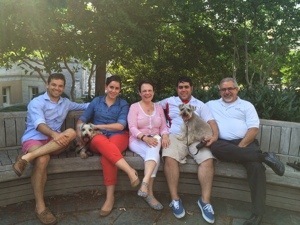 First off, Happy Father’s Day to Ramon, the man who personifies the word. He is the best man for the job and our kids are blessed to have him as their father. 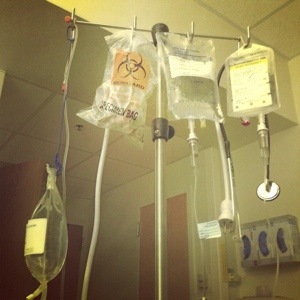 As for me, I was hooked up to one IV bag or another all day long. Today was pivotal as they brought in the big guns to get me ready for transplant in two days. My drug regimen included several new meds by mouth and several intravenously. Added to the protocol were Micafungin which prevents infection in people undergoing stem cell transplant and Prograf, a medicine used to help prevent organ rejection in people who have had a transplant. Melphalan is a cancer medication that interferes with the growth of cancer cells and slows their spread in the body. Interesting thing about this drug, you must eat ice cream, Popsicles, and ice chips during and two hours after its infusion to minimize the mouth sores it causes. For the record, I had strawberry ice cream, chocolate ice cream, a lemon Outshine bar, a fruit and veggie Outshine bar, numerous cups of ice and an Italian ice. So there. Every day in the Winship BMT Unit, we’re expected to walk a minimum of two miles. This translates into 42 laps around the unit – 21 laps per mile. The exercise is meant to keep our muscles and stamina strong as we prepare for the transplant and, then again, on the long road to recovery. It can get pretty congested, specially when a few of us get out there with our IV poles. I did good time and felt strong until the final lap. Within minutes I felt like I’d been overcome by the flu. I was cold, shivering and had unbearable body aches. A quick assessment by my nurse showed that I was running a low-grade fever and that my blood pressure had crashed to unusually low levels. This is a result of doubling the ATG dosage to keep my body from rejecting the new bone marrow. I’m expecting a recurrence tomorrow as the dose will remain high and new drugs will be added to the mix. Rough as it is, the alternative is worse. I spent the rest of the day in bed lifted by visits from dear family and friends. Today, the nurses organized a mini Lancôme makeover party. 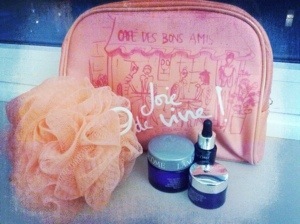 We received samples of products, a cute makeup bag and a shower sponge. They served yummy petit fours and sparkling pink lemonade in little champagne flutes. It’s like a cruise around here. But seriously, these amazing nurses make it worthwhile. I have settled into my new digs and the associated routine of hospital life. The food is the biggest challenge so far. I can’t eat the salads that I love so much nor the fresh plums, peaches and apples I adore. Bacteria in produce makes it unsafe – so I’ve been reduced to oranges and bananas which are protected by their inedible skins. Safe vegetables have to be cooked to within an inch of disintegration in order to be free from bacteria. On the upside, there are these thick milkshakes available every afternoon at 3 PM in chocolate, vanilla and strawberry flavors. I suspect they’re meant for the post-transplant period when nothing stays down and solids are impossible to chew, but I’ve already made them a habit with chocolate being the flavor of choice. Two new conditioning drugs have been added to my regimen. In addition to the Fludaramine started on Tuesday, I now receive a 30-minute infusion of Prednisolone (a steroid) to lessen the adverse effects of Anti-thymocyte globulin (ATG). ATG is an infusion of rabbit-derived antibodies against human T cells and is used in the prevention of rejection in organ transplantation. The ATG infusion runs over 6-hours. Stay tuned, there are more drugs coming prior to the transplant. I know, this is riveting information. You’re welcome. Yesterday, I reported to Emory University Hospital at the crack of dawn to have a triple lumen catheter placed in my carotid artery. The catheter will be the conduit for the chemotherapy infusions needed to kill my faulty bone marrow before the transplant. After the procedure, they whisked me to my in-patient room which will be my home away from home for the next few weeks. The room has floor to ceiling windows which makes it very bright. I also love my little hospital bed. Really. I instantly fell in love with the nurses, techs and doctors who will take care of me during my stay. There’s a gigantic Keurig single-serve coffee maker in the break room which is stocked with all kinds of coffee and tea flavors. There’s also ginger ale, ice cream, Italian ices, crackers and dry cereals. To wrap up the day, I received the first dose of pre-conditioning chemo therapy at 9 PM without any adverse effects. Fludarabine prevents cells from making DNA and RNA, which stops cell growth and causes the cells to die. In six hours, I will be admitted to Winship Cancer Institute to begin a 6-day regimen of intensive chemotherapy. The intention is to destroy all of my damaged bone marrow so I can receive a transplant. The countdown is measured from day -6 to transplant day 0. In hospital speak, when my whole immune system is reset, I will have a new birthday. My donor is enduring a five-day regimen of injections to increase her production of stem cells and force the stem cells out of the marrow and into the bloodstream. On the day of the transplant, she will be hooked up to a machine like a dialysis machine. Blood will flow out of one arm through the machine which will “harvest” the stem cells and the remaining blood will be put back into the other arm. This is about a 6-8 hour process for the donor. The stem cells will be stored in a bag very much like a regular unit of blood. Since the donor is outside of the USA, they will put the harvested cells on a flight to Atlanta, and a courier will transport them to the hospital. This precious lifeblood will need to be transplanted into me within 72 hours. 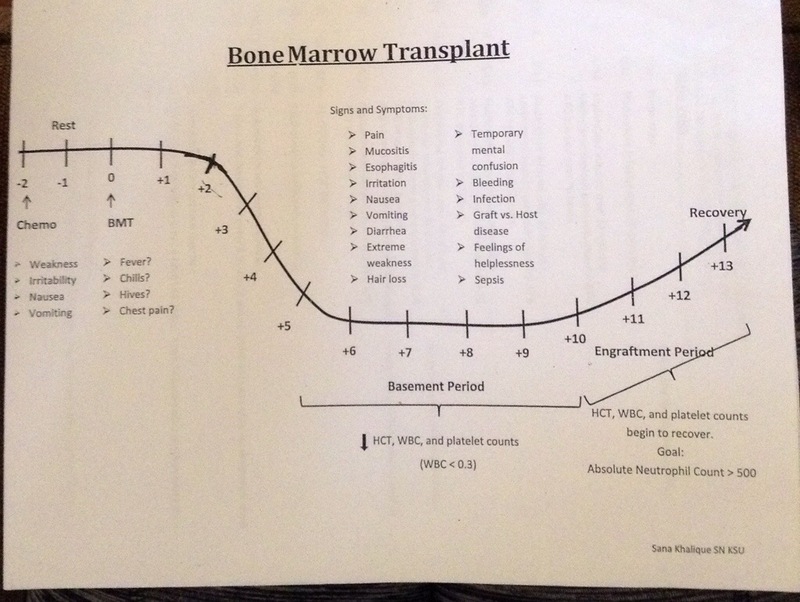 The hope is that the new stem cells will take hold within 30 days and begin to form new bone marrow within my bones. About that point, I will begin to face “rejection” issues — “graft vs host”. Some of this effect is good — the immunity effect of the new “graft” will hopefully destroy any remaining damaged bone marrow and leukemia cells. I’ll remain hospitalized until my new stem cells engraft and begin multiplying. Needless to say, I am very apprehensive about all this, but at least we are moving forward now. 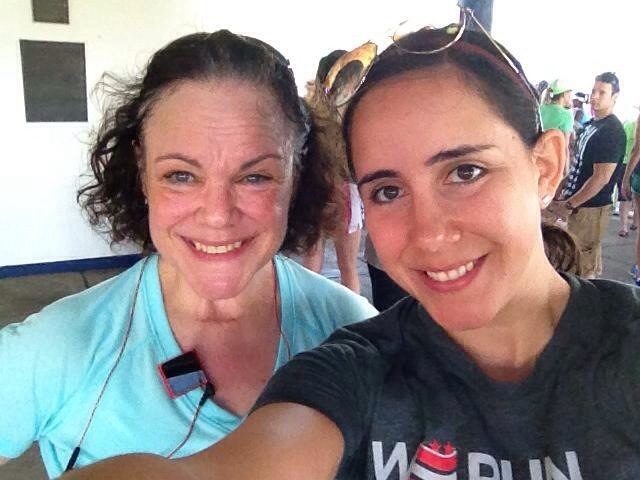 One year ago today, on June 1, 2013, my Kate and I ran our first half marathon in Annapolis, MD. I finished in 2:36. Two weeks later, my health suddenly declined as I presented with daily fevers, shortness of breath, low energy and a persistent pain under my left ribcage. Fear of a heart condition landed me in the hospital for tests. My white blood count was 29,000 and I had a growth in my abdomen. Two hospitalizations, one surgery, two bone marrow biopsies, and three oncologists later, I was diagnosed with chronic myelomonocytic leukemia (CMML). CMML is a disease in which too many white blood cells are in the bone marrow, crowding out other normal blood cells. A bone marrow transplant is the only cure for CMML and at my age, finding a 10-point donor match was essential in order to avoid a recurrence of the disease. During the donor search we managed the disease and its side effects with monthly 7-day rounds of chemotherapy. My siblings generously offered to be tested, but unfortunately they were ruled out as donors for me. Additionally, the initial search with Be the Match Registry didn’t identify a suitable donor either. But, we kept the faith knowing that each month a new search would be performed including international registries not aligned with Be The Match. Miraculously, after a “short” five months of searching the world, my perfect 10-point match with all the necessary cells and whistles for my transplant has been found. Now, the real race begins. I am strong, witty and growing. I am a proud wife and a mom to three grown people and a work-in-progress Christian. I'm a Communications Specialist, an amateur photographer, scrapbooker, quasi quilter and passionate cook, who strives to be kind and to live life to the fullest. I want to figure out my creative life's journey.